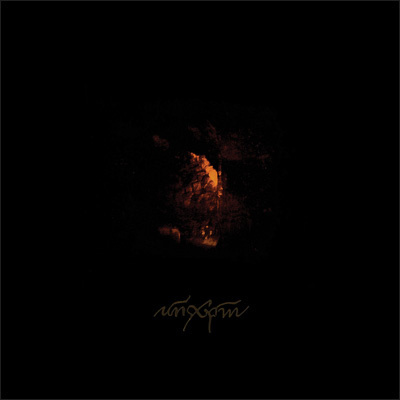 AnXpm, being Unknown Ikon and Karl Emil Lundin (credited here as Fra Abdabor to make things more mysterious and obscure than they already are), addresses it’s eerie homilies in a raw, noisy black metal tone. It isn’t remotely as chaotic and and torturous as Unknown Ikon’s Emit at it’s more deranged moments, instead following a more structured approach of simple but still clearly bizarre songs. The riffing, which tends to be mid-paced to fast strumming, is clear and easy to follow, but always just off enough with oddly atonal and warped note progressions to ensure that the listening experience never approaches comfortable. It more than fits the atmosphere and approach they’ve taken; the lyrics, belted out with vocals ranging from nasally, barked shouts to insane chanting, read like the poetry of a hermit who’s spent the last 3 years of his life fasting in a rain-soaked cave on some miserable and forsaken isle off the coast of England. The claustrophobic production is as rough and draining as sleeping on the damp, rock floor, and Fra Abdabor’s studious drum work is as relentless as the lash with which you scourge your own back. The skin work, as seems to always be a theme in his work, is incredibly creative, contributing to these songs musically much more than the instrument tends to in metal. This quality is most apparent in “Cosmic Seven Radiating Forth”, which, in the spirit of Ildjarn’s Strength and Anger, consists of only a single-note riff and frantically chanted vocals. As boring as that might have had the potential to be, the extremely active drumming becomes the dominant instrument of the song. It has the effect of keeping you drawn into the music, making something that should be monotonous pleasingly hypnotic. “Christ’s Dawn” is the singular offering of Symphonia Sacrosancta Phasmatum, which was the earlier title of Reverorum ib Malacht, and it nearly defies description. Opening with an obscure sample (spoken in Swedish as far as I can tell), faint and disonnat piano stumbling, and dark tones that oscillate between ethereal and ominous. It’s followed by a monstrously downtuned, distorted guitar and pounding, distressing drumming. It almost sounds like early Skepticism, if Stormcrowfleet was recorded in a Lovecraftian nightmare dimension. It follows some structure, but it’s so loose, deranged, and atonal that you’ll be aware of its presence, but you’ll never be able to really identify it. The vocals are a (disappointingly) standard, deep growl, buried somewhere in the middle of the percussion and noise driven production. The entire song has the air of a ritual contorted beyond any reason, filled with bizarre tones and sounds of unknown origin, melding together in strange ways that, despite their misshapen and cacaphanous nature, still do have an engaging nature. I feel I have to mention that ‘Old Hair’, is mentioned as an instrument in the liner notes… Even more so that AnXpm, this is absolutely not everyday music, requiring a certain dedication and intention to listen to and get anything out of. ~ by jakemoran on September 25, 2013. Excellent stuff! Bought this. Hard to fine, and the label is closed down. The Symphonia is very interesting as well! Thanks! Bang worthy indeed, however if your only exposure is this track and you are having initial trouble getting past the vox? Then i suggest this version on you tube which is in my opinion the better of both. To each their own of course. Enjoy.. This entry was posted on September 25, 2013 at 7:20 pm and is filed under A-reviews, ALL REVIEWS, S-reviews, Uncategorized.You can follow any responses to this entry through the RSS 2.0 feed.You can leave a response, or trackback from your own site.